In perhaps the greatest think piece on contemporary theater ever written, journalist Chad Jones asks earnestly, "Why aren't the Muppets Broadway bound? "—an inquiry of polite outrage over the fact that The Muppets' appearance on the New York stage is much-deserved, long-overdue, and, at this time, nowhere in sight. Because I've managed to find some success as a writer, a lot of aspiring artists—writers, actors, musicians—often ask me for advice. They want to know the "secret to success." They want some sort of clear guidance on how to live and work. They want, at the very least, to know how to survive. In other words, they want a piece of me. And oftentimes, I brush them off and demean them and crush their dreams because, really, you gotta eliminate the competition. But, you know, I understand people's need to be pointed in the right direction. Because if you decide you want to become a doctor or lawyer or pursue most any profession, there are definite, concrete things that you have to do. It's really not a mystery how you achieve most career goals. You know, you get a degree or you pass an exam or you do an internship, etc. Logical steps. But artists are left without a guidebook, without a clear-cut plan to dictate what they're supposed to do. So do I recommend higher education? Do I recommend joining organizations that support artists? Do I recommend such seminal books as The Artist's Way by Julia Cameron or Bird by Bird by Anne Lamott? Well, I say, none of these things. I say, go to the store and buy a particular movie on DVD at full price and go home and watch it and study it. This movie is the most accurate guide to being an artist, to surviving as an artist, that I have ever come across. It shows you what artists go through and how they cope and how they can triumph in the end if they so choose. And the name of that movie? The name of that movie is: The Muppets Take Manhattan. I am not kidding. This is not a joke. The adventures of Kermit the Frog and Miss Piggy and friends in this particular movie are archetypal and practical life lessons that have the power to change you. For a long, elaborate, in-depth analysis of the film, you'll just have to wait for a future edition of Jukebox Stories. In terms of deep movie explication, I pretty much blew my wad on HSM3—I need some time to recharge. 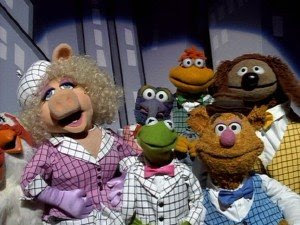 And the "Saying Goodbye" number, in which the Muppets all go their separate ways at one point because they can't make it in New York, is heartbreaking. And I could go on and on, but I won't. You can read Chad's entire piece here.